The legislative session has ended, but the fight for supportive housing continues. 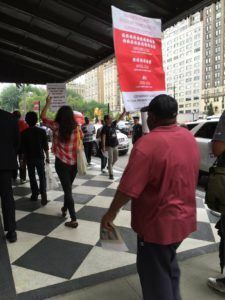 On Tuesday, the Coalition joined homeless New Yorkers and other advocates from the Campaign 4 NY/NY Housing in a picket line outside The Plaza Hotel, where Governor Cuomo was hosting a fundraising event. While Cuomo prepares for his 2018 reelection campaign, 80,000 homeless New Yorkers statewide are languishing in shelters and on the streets, desperately waiting for him to release the $1.9 billion that was set aside for affordable and supportive housing in the State budget. But even though the funds were appropriated, the Governor and legislative leaders only released a meager $150 million in a last-minute agreement. This level of inaction raises questions as to whether Cuomo ever actually planned to keep his promise to homeless New Yorkers. 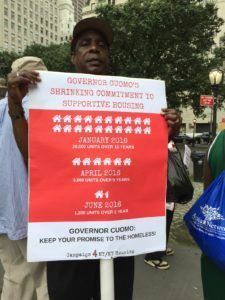 In January, advocates applauded his announcement that he would create 20,000 supportive housing units statewide over 15 years. Then, in April, the State budget set aside $1.9 billion to fund the first 6,000 units along with other affordable housing initiatives – but the money was subject to a Memorandum of Understanding (MOU). Gov. Cuomo, Assembly Speaker Heastie and Senate Majority Leader Flanagan had months to finalize the details of that agreement and release the funds, but in the end they only released $150 million in new funding for 1,200 supportive units. The Campaign 4 NY/NY Housing is committed to pushing the State leaders to follow through on their promise and release the full $1.9 billion for supportive and affordable housing. We plan to keep up the pressure through rallies and actions until that promise is fulfilled. For a lot of us, the hospital’s emergency room is a stressful place. Not so for Glenn Baker. When Baker, 44, steps into the emergency room at the University of Illinois Hospital in Chicago, he’s completely comfortable. He has a favorite double-wide chair in the corner, knows where to find the Cheetos in the vending machine, and the staff is like family. It was a special night for a group of high school students who had it rough growing up. They were homeless and went from shelter to shelter for years. But they didn’t let their circumstance prevent them from achieving. Despite all the odds, they’re graduating from high school, and that’s just the beginning of their bright futures.